RMA-S cells do not express functional TAP, yet they express MHC class I molecules at the cell surface, especially at reduced temperatures (26°C). It is generally assumed that such class I molecules are “empty,” devoid of any associated peptide. A radiochemical approach was used to label class I-associated peptides and to determine the extent to which Kb molecules in RMA-S cells are associated with peptides. These studies revealed that at 26°C Kb molecules in RMA-S cells are occupied with self-peptides. Such peptides stably associate with Kb at 26°C but easily dissociate from them at 37°C, suggesting low-affinity interactions between Kb and the associated peptides. At 26°C, at least some of these Kb molecules are stably expressed in a peptide-receptive state on the cell surface, whereas at 37°C they are short lived and are only transiently capable of binding and presenting exogenously supplied OVA 257–264 peptide for presentation to CD8+ Kb-restricted T lymphocytes. Thus contrary to current models of class I assembly in TAP-deficient RMA-S cells, the presumably “empty” molecules are in fact associated with peptides at 26°C. Together, our data support the existence of an alternative mechanism of peptide binding and display by MHC class I molecules in TAP-deficient cells that could explain their ability to present Ag. Major histocompatibility complex class I molecules assemble in the endoplasmic reticulum (ER)3 with short peptides of 8–12 aa residues. The completely assembled class I molecules then negotiate the secretory pathway and arrive at the cell surface (reviewed in Ref. 1). The display of nonself-peptides derived from intracellular pathogens allows CTL to recognize infected cells (reviewed in Ref. 2). The stability of the class I molecules depends on high-affinity association with peptide. TAP translocates peptides from the cytosol to the lumen of the ER and facilitates peptide binding to class I molecules (reviewed in Ref. 3). In the absence of peptide, partially assembled class I molecules are retained in the ER by a quality control mechanism (4, 5, 6, 7). Partially assembled molecules exist at increased levels in cell lines that lack functional TAP, such as RMA-S (8, 9, 10) and T2 (11, 12) cells. Such TAP-deficient cells express markedly decreased levels of class I molecules at the cell surface (8, 11, 13). However, cell-surface class I expression in the TAP-deficient cells can be rescued by binding specific high-affinity peptides (8), by binding native conformation-dependent Ab (14), or by growth at low temperatures (below 30°C) (11). This feature of class I molecules expressed by TAP-deficient cells has led to the hypothesis that they traffic to the plasma membrane as “empty” molecules. Structural and energetic principles, e.g., the hydrophobic nature of the residues that line the Ag-binding groove, suggest that class I molecules may not exist as “empty” molecules (15). This is further supported by the finding that RMA-S cells infected with vesicular stomatitis virus can present antigenic peptides to specific CTLs (16, 17). Additionally, macrophages of TAP-deficient mice are capable of presenting bacterial Ags to CTL in a class I-dependent manner (18). This raises the possibility that class I molecules can assemble with peptides even in TAP-deficient cells. Consistent with this hypothesis, our data indicate that Kb molecules in TAP-deficient RMA-S cells assemble with low-affinity peptides that are stably bound at low temperatures. At 37°C, such peptides easily dissociate from Kb, resulting in molecules that rapidly lose their ability to bind peptides, most likely due to an irreversible conformational change. RMA and RMA-S were kindly provided by K. Karre (Karolinska Institute, Stockholm, Sweden) and obtained from S. G. Nathenson (Albert Einstein College of Medicine, Bronx, NY). These cell lines were derived from a Rauscher leukemia virus-induced C57BL/6 T cell lymphoma, RBL-5 (19). RMA-S is a TAP-2 mutant cell (20) that expresses low levels of H-2b class I molecules at the cell surface (8). Both the cell lines were maintained in RPMI 1640 (Life Technologies, Rockville, MD) or in D10F:DMEM (Life Technologies) supplemented with 10% FBS (HyClone, Logan, UT), antibiotics (penicillin and streptomycin), and l-glutamine at 37°C in an atmosphere of 5% carbon dioxide. In experiments requiring class I expression at lower temperature, RMA and RMA-S cells were maintained for 16–18 h at 26°C. Approximately 5 × 108 cells were metabolically labeled with 5 mCi of [3H]phenylalanine (Amersham, Arlington Heights, IL) or [3H]tyrosine (DuPont New England Nuclear, Boston, MA) for 4.5 or 7 h at 37°C following deprivation of l-phenylalanine or l-tyrosine, respectively, for ∼60 min in reconstituted MEM lacking l-phenylalanine or l-tyrosine but supplemented with 10% dialyzed FBS (JRH Biosciences, Lenexa, KS). The labeled cells were washed extensively with ice-cold PBS and solubilized in 10 ml of Tris-Cl buffer (20 mM Tris-Cl, pH 8.0, and 150 mM NaCl) containing 1% 3-[(3-cholamidopropyl)dimethylammonio]-1-propanesulfonate (CHAPS) and 1 mM EDTA. Cell lysis proceeded for ∼30 min at 4°C with gentle rocking. To determine whether peptides bind Kb molecules during detergent solubilization of radiolabeled cells, RMA-S cells maintained at 37°C were labeled with 5 mCi of [3H]tyrosine at this temperature. They were washed extensively and solubilized as detailed above. The resulting postnuclear lysate was used to solubilize an equal number of RMA-S cells maintained at 26°C for ∼16–18 h.
Class I molecules were purified by immune precipitation or affinity chromatography as described (21). Immune precipitation was performed as follows. The postnuclear lysate (5000 × g, 60 min at 4°C) of CHAPS-solubilized cells was precleared with ∼0.25 ml normal mouse serum (NMS; Cedarlane, Hornby, Ontario, Canada) simultaneously bound to 1.0 ml of protein A-Sepharose (Repligen, Needham, MA) overnight at 4°C with gentle rocking. The resulting supernatant was then incubated with ∼0.25 ml Y3 ascites simultaneously bound to 1.0 ml of protein A-Sepharose at 4°C with gentle rocking for 1 h. Y3 is a native conformation-dependent mAb specific for Kb (22) that was kindly provided by Dr. S. G. Nathenson. The immune complex was washed and eluted as described below. Kb molecules were affinity purified as follows. The postnuclear fraction (described above) was precleared by passage over a column of NMS coupled to protein A-Sepharose beads. The flow-through was then passed over Y3-coupled protein A-Sepharose affinity column. Following the application of each lysate, columns were washed extensively with Tris-Cl buffer containing detergent (20 mM Tris-Cl, pH 8.0, 500 mM NaCl, and 0.5% Nonidet P-40) followed by an extensive wash in Tris-Cl (20 mM, pH 7.4) buffer alone. The immunoadsorbed material from the Y3 affinity column was eluted using 6 ml of 0.2 N acetic acid (pH ∼2.9). The Kb-peptide complexes were heat denatured in a boiling bath for 7 min after lowering the pH of the eluate to ∼1.9 with glacial acetic acid. Upon cooling, peptides contained within the eluate were separated from the class I H and L chains by Centricon 3 filtration (3000 Da cutoff; Amicon, Beverly, MA); the low molecular mass ligands in the filtrate is the first peptide eluate. The retentate was neutralized with 10% ammonium hydroxide containing 1.0% 2-ME and further denatured with 0.1% TFA in a boiling bath. The peptides, after cooling to room temperature, were isolated by Centricon 3 filtration as described above; the low molecular mass ligand in the filtrate is the second peptide eluate. The resulting two filtrates were pooled, and 90% of the complex mixture of self-peptides in the filtrate was concentrated to ∼0.1 ml by vacuum centrifugation and separated by reversed phase chromatography (RP-HPLC) as described (21, 23). In the experiment described in Fig. 1⇓, the concentrated filtrate was applied onto a RP-8 column (2.1 × 100 mm; Alltech Associates, Deerfield, IL) in buffer A composed of 0.1% TFA. The bound peptides were eluted using a gradient of buffer B consisting of 0.1% TFA in acetonitrile over a 60-min period delivered at a rate of 0.25 ml/min using HP1090 HPLC (Hewlett-Packard, Palo Alto, CA). Two drop fractions were collected automatically (LKB Instruments, Gaithersburg, MD) between 10 and 53 min (∼200 fractions). Radioactivity in each fraction was measured using a scintillation counter (Beckman, Fullerton, CA). In subsequent experiments, the concentrated filtrate was loaded onto a C18 RP Nucleosil column (1 × 250 mm; Alltech Associates) equilibrated with buffer A (0.06% TFA in 5% acetonitrile) and eluted with a gradient of buffer B (0.05% TFA in 80% acetonitrile) established at 0.05 ml/min using HP1090 WIN. Peptide elution was achieved by increasing buffer B from 0% at 10 min to 37% at 73 min, 70% at 105 min, 90% at 115 min, and 100% at 120 min, with two drop fractions being collected between 30 and 110 min (∼150 fractions) automatically into a microtiter plate (Gilson, Middleton, WI). Radioactivity in each fraction was measured using a scintillation counter. H-2Kb molecules expressed by TAP-deficient RMA-S and wild-type RMA cells associate with metabolically labeled peptides at 26°C. H-2Kb molecules were immunoprecipitated with a conformation-dependent mAb, Y3, from [3H]phenylalanine-labeled postnuclear fraction of RMA-S (A) and RMA (B) cells maintained at the indicated temperatures. Peptides isolated from the Kb molecules were fractionated by narrow bore reversed phase chromatography as described in Materials and Methods; two drop fractions were collected between 10 and 53 min, during which time Kb-associated peptides are known to elute from the column (23 27 ). Radioactivity was measured at each step of class I and peptide isolation as well as in each of the fractions resulting from the RP-HPLC. The quantity of immunoprecipitated Kb and the associated peptides at 26°C and 37°C are indicated in the left and middle insets, respectively. The calculated Kb to peptide ratio is presented in the right inset. Note that the smaller the Kb to peptide ratio, the greater the number of class I molecules occupied by the ligand. It is estimated that about two-thirds of the Kb molecules expressed by RMA-S cells at 26°C are occupied with peptides. In contrast, only one-third of the Kb molecules are occupied by peptides in RMA-S cells at 37°C, because the ratio of peptide to Kb is 1:110. Refer to Materials and Methods and Results for a discussion on the estimation of the stoichiometry of Kb-peptide complexes. The yield of [3H]phenylalanine-labeled affinity-purified Kb molecules and the associated peptides that separated into the Centricon 3 filtrate were quantitated as follows. The radioactivity contained in an ∼0.475-ml aliquot of 10.0 ml of affinity-purified class I solution was measured by scintillation counting; similarly, the radioactivity contained in a 0.1-ml aliquot of 3.4 ml of the first peptide eluate and another 0.1-ml aliquot from 2.0 ml of the second peptide eluate were measured. The ratio of the sum of the radioactivity contained within the two peptide eluates to that of the affinity-purified class I molecules was used to estimate the occupancy of Kb by peptides. In this calculation, one phenylalanine residue is assumed in the peptide ligand that separated into the two peptide filtrates and 12 phenylalanine residues in the affinity-purified class I complex, seven in the H chain, four in β2-microglobulin (β2m), and one in the peptide. Clearly, a limitation of such an estimate of peptide occupancy of class I molecules using a single amino acid probe is the fact that it excludes ligands that do not use phenylalanine residue in its sequence. RMA-S cells were maintained for 16–18 h at 26°C or at 37°C, metabolically labeled at the same temperature as described above and washed thoroughly in ice-cold PBS. RMA-S cells labeled at 26°C were divided in two equal parts of ∼5 × 108 cells each; one aliquot was resuspended in 10 ml PBS at 37°C and the other in 10 ml of PBS at 26°C. RMA-S cells labeled at 37°C were resuspended in 10 ml of PBS at 37°C; incubation was continued at the specified temperatures (i.e., that of the PBS used to resuspend the cells) for 1 h. This is the release step of the assay. The supernatant from this step was collected following the removal of cells by centrifugation (∼2500 rpm for 15 min) and cooled to 4°C. The resulting supernatant was used to resuspend ∼1 × 109 unlabeled RMA-S cells maintained at 26°C for ∼24 h. CHAPS was added to this mixture to make a final concentration of ∼1% (w/v). After cell lysis, the postnuclear fraction, prepared as described above, was incubated for 16–18 h at 4°C. This is the capture phase of the assay. Kb-associated peptides were isolated and analyzed as described above. RMA and RMA-S cells were cultured overnight (18 h) at 26°C or 37°C and for an additional 2 h under the same conditions with or without the addition of 2 μg/ml brefeldin A (BFA; Sigma, St. Louis, MO). OVA 257–264 (OVA8) peptide was then added at various concentrations for an additional 2 h. The cells were then washed with DMEM at 4°C, fixed with 1% paraformaldehyde (Fisher Scientific, Pittsburgh, PA), and washed extensively with DMEM. The level of Kb:OVA8 complexes was detected by overnight incubation of the fixed cells in D10F with CD8OVA1.3 T hybridoma cells (24), followed by a CTLL bioassay for IL-2 secretion by the T hybridoma cells. A standard IL-2 bioassay (25) was used with the following modifications. IL-2-dependent CTLL-2 cells were incubated for 24 h at 37°C with supernatants collected from Ag presentation assays. The CTLL-2 cells were then incubated for 18–24 h with Alamar blue (Biosource International, Inc., Camarillo, CA ), a colorimetric oxidation-reduction indicator. Alamar blue is reduced by metabolically active cells, leading to a shift in the relative absorbance at wavelengths near 570 and 600 nm, which can be used to quantitate cell growth (26). All Ag presentation assays were done with triplicate points, and data points are presented as mean (OD550-OD595) ± SD (SD indicated by error bars). To address the question whether class I molecules assemble with peptides in TAP-deficient cells at 26°C, we used a radiochemical approach (23, 27) wherein RMA-S (TAP-2 mutant) and RMA (wild type) cells were metabolically labeled with a tritiated amino acid at 26°C or at 37°C. This resulted in the labeling of both the class I molecules and the self-peptides associated with them. Because peptides that bind and assemble with Kb molecules use phenylalanine and/or tyrosine as anchor residues at position 3 and 5 of the ligand (21, 23, 28), [3H]phenylalanine was used as the radioactive tag. However, labeling with a single amino acid probe excludes Kb-binding peptides that do not use phenylalanine in its sequence (23, 27, 28, 29). Thus RMA and RMA-S cells were grown at 26°C or 37°C for 16 to 18 h, starved for phenylalanine for 1 h, and metabolically labeled with [3H]phenylalanine for ∼7 h at 26°C or 37°C, respectively. To isolate peptides associated with Kb, the radiolabeled cells were solubilized in detergent, and Kb molecules were immunoprecipitated using a specific mAb, Y3. Y3 was used in these experiments because it is a conformation-dependent mAb and reacts only with those Kb molecules that are completely assembled with β2m and peptides (21). Peptides were eluted by heat denaturation at low pH, separated from the H and L chains by Centricon 3 filtration, and fractionated by RP-HPLC. At each step, the yield was determined by monitoring the amount of radioactivity incorporated. Consistent with previous findings (10, 11), both RMA-S (Fig. 1⇑A, left inset) and RMA (Fig. 1⇑B, left inset) assemble higher amounts of Kb molecules at 26°C compared with those that assemble at 37°C. Moreover, the increased Kb expression seen at 26°C is associated with an increase in the amount of peptide recovered in the filtrate after Centricon 3 filtration (Fig. 1⇑). These results demonstrate that class I molecules assemble with peptides at 26°C even in cells that express dysfunctional TAP molecules. Comparison of the levels of radioactivity associated with Kb and the peptides that fractionate into the Centricon 3 filtrate (Fig. 1⇑, insets) revealed a ratio of 1:49, 1:64, 1:110, and 1:44.5 of peptide to Kb in RMA at 37°C, RMA at 26°C, RMA-S at 37°C, and RMA-S at 26°C, respectively (Fig. 1⇑, right insets). Also note that more peptides were associated with Kb molecules expressed by RMA cells at 37°C compared with those expressed by RMA at 26°C, RMA-S at 37°C, and RMA-S at 26°C (Fig. 1⇑ insets). A ratio of ∼1:12 (seven, four, and one phenylalanines in the H chain, β2m, and peptide, respectively) would be predicted when class I and the associated ligand are at 1:1 stoichiometry. However, because of 1) losses (30–40%; (30, 31, 32) incurred during peptide isolation and separation; 2) the presence of phenylalanine at other positions, in addition to that at position 5, of Kb-binding peptides (13%; 5 of 38 peptides from Ref. 29); and 3) the presence of peptides with amino acid residues other than phenylalanine at position 5 (∼40–50% based on pool sequencing data (28) and on 14 of 38 peptides having tyrosine at position 5 (29)), a ratio of 1:30–1:35 would approximate a 1:1 stoichiometry of peptide to Kb. Hence it is estimated that about 80% of Kb molecules expressed by RMA-S cells at 26°C are occupied with peptides compared with about 30% occupancy of Kb assembled at 37°C by RMA-S. These values of peptide occupancy should be considered strictly as estimates because the parameters (1 through 3, above) used for such calculations are rough approximations and assume that all 12 phenyalanines in the H chain, β2m, and peptide are uniformly labeled. Notwithstanding, it is reasonable to conclude that more than twice as many Kb molecules expressed by RMA-S cells at 26°C are occupied with peptides compared with those assembled by RMA-S at 37°C. To determine whether peptides actually bind to Kb molecules in living cells or whether they bind after cell lysis, RMA-S cells were grown at 37°C, labeled with [3H]tyrosine at this temperature, and solubilized with detergent. This lysate, which is a potential source of labeled peptides but a poor source of Kb molecules, was used to solubilize an equal number of unlabeled RMA-S cells grown at 26°C for ∼24 h. As control, RMA-S cells grown at 26°C were starved and labeled with [3H]tyrosine. Peptides from affinity-purified Kb molecules of RMA-S cells were resolved by RP-HPLC (using a gradient different from the one used in Fig. 1⇑), and the radioactivity in each fraction was monitored. Kb molecules from unlabeled RMA-S cells that were solubilized in the presence of the labeled lysate contained only a low level of associated peptides (∼50% of the level seen associated with Kb at 26°C; Fig. 2⇓, inset), which can be explained by the level of complexes present in RMA-S cells labeled and solubilized at 37°C (∼40–50% of that associated with Kb assembled at 26°C; see Figs. 1⇑ and 2⇓, insets). These results demonstrate that at least half as many peptides, if not more, bound to Kb molecules in TAP-deficient RMA-S cells at 26°C bind before detergent lysis of cells. Peptides associate with H-2Kb molecules during de novo assembly at 26°C in TAP-deficient RMA-S cells. 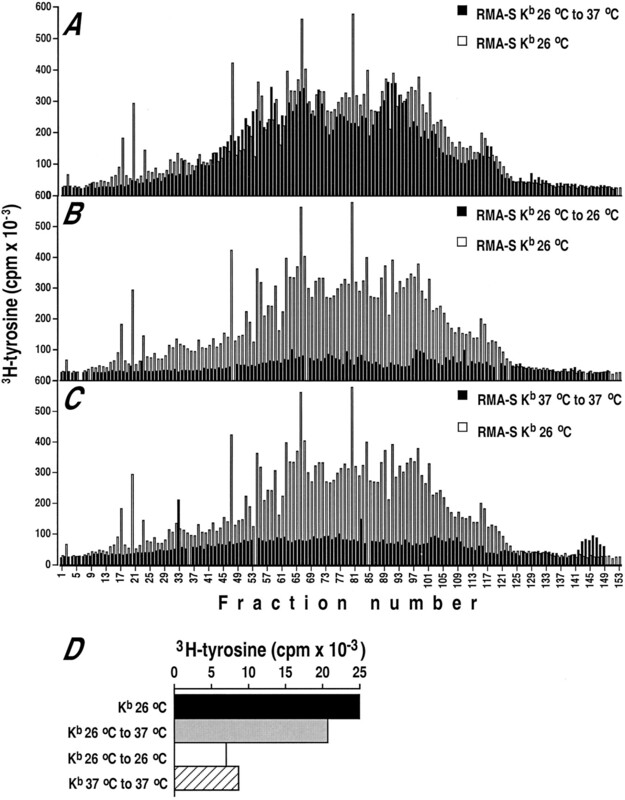 Peptides were isolated from Kb molecules immunoaffinity-purified (Y3 cross-linked protein A-Sepharose column) from RMA-S labeled with [3H]tyrosine at 26°C (open bars in the background) or from unlabeled RMA-S maintained for 24 h at 26°C cells that were mixed with the postnuclear fraction of RMA-S cells labeled with [3H]tyrosine at 37°C. The resulting peptides were fractionated by microbore reversed phase chromatography as described in Materials and Methods; two-drop fractions were collected between 20 and 115 min and the associated radioactivity was measured. The inset shows the amount of radioactivity associated with peptides bound to Kb molecules at 26°C and 37°C after RP-HPLC. The above finding that TAP-deficient RMA-S cells assemble class I molecules with peptides at 26°C raises the question as to the nature of such peptides. If these peptides have low affinity for Kb, they could bind to Kb stably at 26°C, but weakly at 37°C. Such peptides would dissociate from Kb molecules when cells are shifted from 26°C to 37°C. To test this hypothesis, we established an in vitro peptide release and capture assay. RMA-S cells were labeled with [3H]tyrosine at 26°C and washed thoroughly with chilled PBS to remove unincorporated radioactivity. The cells were then resuspended in warm (37°C) PBS and incubated at 37°C for 1 h to release weakly bound low-affinity peptides. After pelleting the cells, the supernatant was chilled and used to resuspend a fresh batch of unlabeled RMA-S cells grown at 26°C. This cell suspension was then solubilized by the addition of detergent; the postnuclear fraction was then incubated at 4°C for ∼16–18 h. This allows radioactive peptides that were released at 37°C to be captured by binding back to Kb. Kb was affinity purified from the postnuclear fraction, and the captured peptides were isolated, separated, and counted as described above. The radioactive peptide profile obtained from this experiment is essentially similar to the profile of peptides labeled and eluted from Kb molecules assembled at 26°C (Fig. 3⇓A). This demonstrates that peptides assembled with Kb at 26°C in RMA-S were released by incubation at 37°C, and the released peptides were then captured by Kb molecules at 4°C. H-2Kb molecules in TAP-deficient RMA-S cells assemble with low-affinity peptides at 26°C that dissociate at 37°C upon arrival to the plasma membrane. RMA-S cells were labeled with [3H]tyrosine at 26°C or at 37°C and washed thoroughly with ice cold PBS to remove any unincorporated radiolabel. Cells labeled at 26°C were resuspended in PBS and incubated either at 37°C or at 26°C for 1 h, whereas cells labeled at 37°C were incubated at 37°C for 1 h. Peptides released into PBS were collected after separating them from the cells and added to unlabeled RMA-S cells maintained at 26°C for ∼24 h. Detergent was added to this mixture to solubilize the unlabeled cells, and the postnuclear fraction was incubated overnight at 4°C to allow capture of any released peptide. Kb molecules and associated peptides were isolated and fractionated as described in the legend to Fig. 2⇑. Reversed phase chromatography profiles of peptides labeled at 26°C and released at 37°C (A), labeled at 26°C and released at 26°C (B) or labeled at 37°C and released at 37°C (C) are shown overlaid on the RP-HPLC profile of peptides associated with Kb molecules at 26°C. For comparison, the total radioactivity associated with peptides bound to Kb molecules under each condition following RP-HPLC is represented (D). Note that the experiments represented in here and in Fig. 2⇑ were performed together, hence the RP-HPLC profile of peptides eluted from Kb molecules of RMA-S cells at 26°C in both figures are the same. To exclude the possibility that the release and capture observed in this experiment could be nonspecific, RMA-S cells were labeled at 26°C, washed thoroughly with PBS and then incubated at 26°C in PBS; additionally, cells labeled at 37°C were washed thoroughly with PBS and incubated in PBS at 37°C. Peptides are not released into PBS under these conditions (compare Fig. 3⇑, B and C, with Fig. 3⇑A; see also Fig. 3⇑D). Thus in TAP-2-deficient RMA-S cells, Kb molecules assemble with low-affinity peptides at 26°C, but the resulting complexes were thermolabile and dissociate at 37°C. While TAP-deficient RMA-S cells assemble Kb with low-affinity peptides to form heat labile complexes, the fate of such class I molecules at 37°C is unclear. Recent studies have demonstrated that class I molecules are delivered through the Golgi apparatus to the cell surface at similar rates in both wild-type and TAP-deficient cells (12, 33, 34). However, at 37°C RMA cells have higher levels of class I expression than RMA-S cells (33, 34). Thus, after reaching the plasma membrane of RMA-S cells, peptide-associated class I molecules may release low-affinity peptides, undergo an irreversible conformational change, and be degraded. If this is true, then class I molecules already expressed at the cell surface of TAP-deficient RMA-S cells will rapidly become unreceptive to peptides and will not function as Ag-presenting molecules. To explore this hypothesis, we tested the ability of RMA and RMA-S cells to bind and present exogenous OVA 257–264 (OVA8), an immunodominant Kb-restricted peptide, under different conditions. Cells were grown for 20 h at 26°C or 37°C with or without the addition of BFA for the last 2 h, and OVA8 was then added for an additional 2 h. Cells were washed to remove excess peptide and fixed with paraformaldehyde. The ability of the fixed cells to present the antigenic peptide to CD8+ OVA-specific Kb-restricted T cell hybridoma (CD8OVA) cells was determined using IL-2 release from activated T cells as the readout. RMA and RMA-S cells had approximately equal levels of peptide-receptive Kb molecules at 26°C, as judged by their equivelant ability to bind peptide and present it to T cells (Fig. 4⇓). In contrast, incubation at 37°C dramatically reduced the ability of Kb on RMA-S cells to bind and present OVA8 (approximately one order of magnitude lower in the peptide dose-response curve; see Fig. 4⇓B), while the function of Kb on RMA cells was similar at 37°C and 26°C (Fig. 4⇓A). 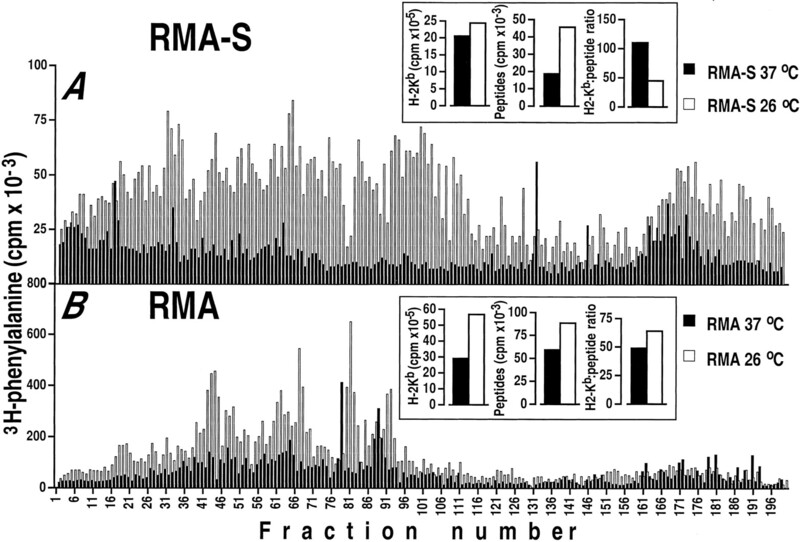 These results demonstrate that the peptide-receptive class I molecules are expressed on RMA-S cells at 26°C, but at significantly reduced levels at 37°C. H-2Kb molecules are only transiently peptide receptive at the surface of TAP-deficient RMA-S cells at 37°C. 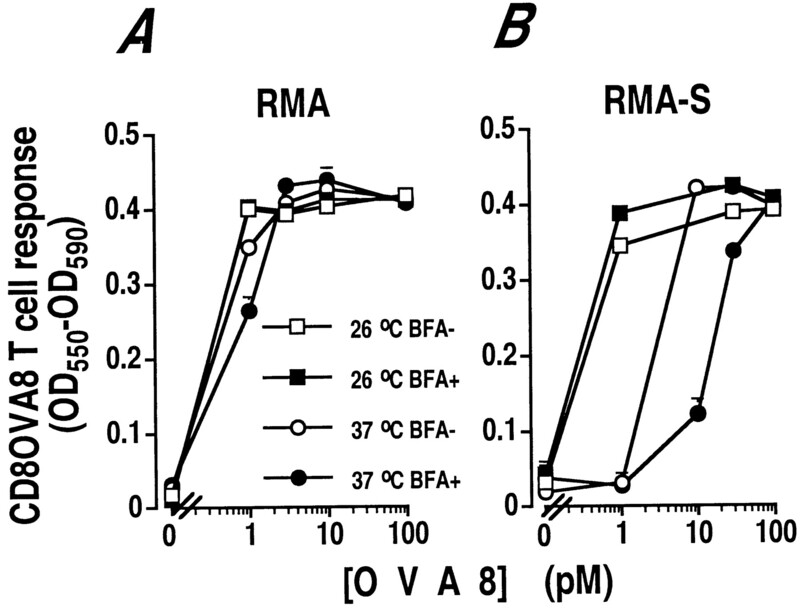 RMA (A) and RMA-S (B) cells were grown for 20 h at 26°C or at 37°C, with or without the addition of BFA for the last 2 h. The cells were then incubated with OVA8 under the previous conditions for another 2 h. The cells were then washed, fixed with paraformaldehyde, and used to stimulate CD8+ OVA8-specific T cell hybridoma. T cell activation was measured by CTLL bioassay for IL-2 using Alamar blue as a colorimetric readout for metabolic activity of CTLL (see Materials and Methods). In A, the 26°C BFA− symbols overlap the 26°C BFA+ symbols. BFA is known to block anterograde Golgi transport and prevent export of proteins from the ER to the cell surface (35, 36, 37, 38). Thus, in the presence of BFA we were able to determine the function of Kb molecules that were already expressed at the cell surface of TAP-deficient RMA-S cells for a significant period (2 h of BFA incubation), in comparison to newly arriving class I molecules (in the absence of BFA). The presence of BFA did not affect the levels of peptide-receptive class I molecules at the cell surface of both RMA (Fig. 4⇑A) and RMA-S (Fig. 4⇑B) cells grown at 26°C. BFA treatment of RMA and RMA-S cells grown at 26°C does not alter the cell-surface expression of Kb molecules as judged by flow cytometry using two conformation-dependent mAb Y3 and AF6 (data not shown). Y3 reacts with fully conformed and peptide-receptive Kb molecules but not with molecules that have lost their native conformation (21, 33, 34). Therefore, these data indicate that both RMA and RMA-S express stable pools of post-Golgi peptide-receptive class I molecules at 26°C. At 37°C, BFA treatment resulted in only a minimal decline in OVA8 presentation by RMA cells (Fig. 4⇑A). However, at 37°C BFA further reduced the ability of Kb molecules on RMA-S cells to bind OVA8 for presentation to T cells (an additional order of magnitude lower in the dose-response curve; see Fig. 4⇑B). The reduced recognition of OVA8 by specific CTL is consistent with the time-dependent decrease in the cell-surface expression of Kb molecules of RMA-S grown at 37°C in the presence of BFA (t1/2 of <2 h of Y3- and AF6-reactive Kb molecules on the surface of BFA-treated RMA-S cells grown at 37°C; data not shown). These results suggest that the level of peptide receptive Kb molecules that remained on the cell surface of RMA-S at 37°C was highly dependent on the continuous delivery of newly synthesized molecules to the plasma membrane. Thus at 37°C most peptide-receptive class I molecules on RMA-S cells exist only transiently at the cell surface. Studies with TAP-deficient RMA-S and T2 cells have suggested the following model for class I assembly and its intracellular traffic in TAP-deficient cells (1). In the ER, the class I H chain partially folds and noncovalently associates with β2m probably assisted by calnexin, a chaperone. In RMA-S cells, these class I molecules bind to TAP-1 (39). Because RMA-S cells are TAP-2 deficient, they do not form functional TAP heterodimers and hence cannot efficiently supply cytosolic peptides for class I assembly in the ER. Thus a majority of the class I molecules are incompletely assembled, presumably peptide free, and are retained in the ER by a quality control mechanism (5). Some class I molecules in the TAP-deficient cells do indeed egress from the ER at a rate very similar to that of the wild-type cells that express functional TAP heterodimers (12, 33, 34). They are observed throughout the Golgi stacks, the trans-Golgi network and the plasma membrane, albeit in smaller quantities compared with the completely assembled molecules (12, 33, 34). Such class I molecules arriving at the cell surface of TAP-deficient cells are predicted to be “empty,” devoid of constitutively associated peptides, because exogenous peptides that bind the class I molecule can stably maintain them at the cell surface (8). In an approach to delineate the mechanism by which class I molecules assemble and traffic to the plasma membrane in TAP-deficient cells, we have demonstrated that Kb molecules in RMA-S cells are constitutively associated with self-peptides. Such peptides bind Kb at 26°C but dissociate at 37°C, suggesting that they have low affinity for Kb. The peptide-free class I molecules are short lived at 37°C and are only transiently capable of binding exogenous peptides. Thus contrary to current models of class I assembly in TAP-deficient RMA-S cells, the presumably “empty” molecules are in fact constitutively associated with low-affinity self-peptides at 26°C. At 37°C, low-affinity peptides may dissociate rapidly, such that most are lost soon after arrival at the cell surface. Exogenously supplied peptides may bind and stabilize class I molecules at 37°C, but only if this occurs in the short period before the peptide-receptive class I molecule becomes denatured. In the absence of exogenous peptides, class I molecules undergo an irreversible change, probably in conformation, resulting in class I molecules that are inept peptide receptors (33, 34, 40). This model is further supported by our finding that BFA depletes peptide-receptive class I molecules at 37°C, whereas peptide-receptive Kb molecules are stably expressed on the plasma membrane of RMA-S cells at 26°C. The above model fits the results of mouse class I assembly and traffic in RMA-S cells. However, mouse class I molecules behave differently in TAP-deficient human T2 cells. In contrast to their instability in RMA-S at 37°C (8), Kb, Db, and Dp are stably expressed on the plasma membrane of T2 cells (41), despite the fact that HLA-B5 and ectopic HLA-A3 class I are unstable at the cell surface under these conditions (12, 41). Additionally, Kb and Db molecules, akin to their behavior in T2 cells, are stable at the cell surface of RMA-S cells expressing human β2m (RMA-S/hβ2m) (42). The biochemical basis for this difference remains unclear. Based on the finding that a fraction of Kb and Db molecules of RMA-S/hβ2m cells are not associated with human or mouse β2m, it was concluded that the traffic and stable surface expression of the mouse class I molecules in TAP-deficient human cells may be intrinsic to their structure (42). On the basis of our results, we suggest that in T2 cells, mouse class I molecules may initially assemble with peptides that dissociate at 37°C leaving the molecules “empty” at the cell surface. The “empty” class I molecules may then be maintained in a stable native conformation because of hβ2m (40, 42). Studies of constitutive peptide association with mouse class I molecules in human T2 and in RMA-S/β2m cells under conditions similar to those reported here should eventually resolve the two models. The finding that Kb molecules associate with peptides at 26°C raises questions concerning the chemical nature, the source, and the intracellular site of assembly of such class I ligands. RMA-S cells infected with vesicular stomatitis virus can present derived antigenic peptides to specific CTL (16, 17). This suggests that antigenic peptides that contain the canonical motif for binding Kb can assemble with the class I molecule in TAP-deficient RMA-S cells. Recently, a Db-restricted CTL epitope derived from the minor histocompatibility Ag H-13a was shown to be presented by TAP-deficient RMA-S cells to specific T lymphocytes (43). Interestingly, the H-13a- and the H-13b-derived epitopes do not contain the Db-binding motif (43). Thus class I molecules that assemble with peptides in the absence of functional TAP molecules may or may not contain the canonical class I binding motif. Such class I-peptide complexes assembled in TAP-deficient RMA-S cells can participate in immune responses (16, 17, 43, 44, 45, 46, 47). Cytosolic (16, 17), endosomal/lysosomal (18, 45, 46, 47, 48, 49) and extracellular (47, 50) Ags associate with class I molecules in TAP-deficient cells. Direct delivery of peptides into the ER from outside the cell has been demonstrated to be one mechanism by which TAP-deficient cells can load class I molecules with ligands (50). Additionally, peptides may be generated in vacuolar compartments and associate with class I molecules in a post-Golgi vesicle, possibly an endocytic or phagocytic compartment that may contain recycling class I molecules (18, 44). Our preliminary studies using BFA or chloroquine to probe where Kb associates with [3H]tyrosine-labeled peptides at 26°C in RMA-S cells implicate a secretory post-Golgi vacuolar compartment as the site for the assembly process (A.D.D., A.B., and S.J., unpublished observations). Thus the assembly of class I-peptide complexes in TAP-deficient cells at low temperatures could occur at multiple intracellular sites. In conclusion, the data presented herein supports the existence of an alternative TAP-independent mechanism for peptide binding and display by class I molecules. Such a pathway could explain Ag presentation by class I molecules to specific CTL in TAP-deficient cells (16, 17, 18, 43, 44, 45, 46, 47). The contribution of this mechanism in normal cells is unclear. However, this system reveals an association of class I molecules with low-affinity peptides that has not been appreciated using other approaches. We thank M. H. Hunsinger for technical assistance; G. M. Van Bleek for teaching us the radiochemical method for the analysis of class I-associated peptides; S. G. Nathenson for Y3 hybridoma and Ab; and J. R Bennink, M. E. Embers, and J. W. Yewdell for helpful discussions and critical reading of the manuscript. ↵1 This work was supported by National Institutes of Health Grants AI-34343, CA-70149, AI-35276 (C.V.H. ), HL-54977 (S.J. ), and a grant from the Children’s Miracle Network (S.J.). S.J. is the recipient of the American Cancer Society’s Junior Faculty Research Award. 3 Abbreviations used in this paper: ER, endoplasmic reticulum; CHAPS, 3-[3-(cholamidopropyl)dimethylammonio]-1-propanesulfonate; NMS, normal mouse serum; RP-HPLC, reversed phase HPLC; BFA, brefeldin A; β2m, β2-microglobulin. Schumacher, T. N., D. B.M., L. N. Vernie, W. M. Kast, C. J. M. Melief, and H. L. Ploegh. 1990. Direct binding of peptide to empty MHC class I molecules. Cell 62:563. Joyce, S., T. P. J. Garrett, J. Geliebter, R. Sun, and S. G. Nathenson. 1991. Structural correlates of MHC class I-restricted, antigen-specific, and alloreactive immunity. In Antigen Processing and Recognition, Ch. 5. J. McCluskey, ed. CRC Press, Boca Raton, p. 109. Rammensee, H. G., J. Bachmann, S. Stevanovic. 1998. MHC Ligands and Peptide Motifs R.G. Landes Bioscience, Austin. Suh, W., M. Cohen-Doyle, K. Fruh, K. Wang, P. P. A., and D. Williams. 1994. Interaction of MHC class I molecules with the transporter associated with antigen processing. Science 264:1322.